Colonize solar systems, annihilate homeworlds, and exterminate your foes in epic interplanetary battles with multiple players and thousands of units. 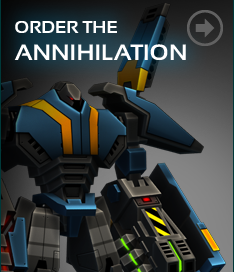 Planetary Annihilation is a next-generation RTS that takes the genre to a planetary scale. Blow up everything, anywhere; dominate with punishing spacecraft, robots, and other futuristic machines of war. Arm asteroids and send them on planet-destroying collision courses. Galactic War is a twist on traditional real-time strategy campaigns that has players battling across a dynamic galaxy filled with procedurally-generated content. Every playthrough is different. Annihilation is final. Play with up to ten friends (or enemies) in massive free-for-all and team-based matches. Spectate matches with a suite of incredible viewing options or broadcast with integrated Twitch.TV support. With intuitive drags and clicks, seamlessly switch between planets, mine resources, create custom unit formations, or pulverize armies. View and interact with your units on another planet in a second window as you focus and control the action in your primary view. View in-match recordings in real-time while matches are in progress. See when a battle turned by rewinding the game to any point or check out the entire match after a game ends. Don’t just win, annihilate. End games with the mother of all weapons: an asteroid on a collision course. Using our procedural planet generator, you will get new, unique and interesting play fields to wage your wars on. The Planetary Annihilation engine was built for this project, so we could make the game that we wanted to make. Built by the same engineers who built the Total Annihilation and Supreme Commander rendering engines. Built to Mod: Create new units, gametypes, maps and more. Run your own server with your own custom rulesets. Client-server asynchronous technology allows games to offload much of the gameplay heavy lifting to the server, so your game isn’t held back by the slowest machine in your game.